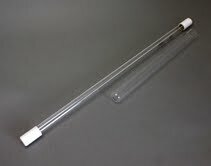 For most practical UV applications in water treatment today, the light is generated by a mercury vapor lamp, or in a gas mixture that contains mercury. Mercury is the gas of choice because the light it puts out is in the germicidal wavelength range. Lamp output depends on concentration of mercury within the lamp, and the concentration depends on pressure. Low pressure lamps (called LP), the most common, produce UV light primarily at 253.7 nm, an ideal treatment wavelength. Some newer lamps are called “low pressure/high output" (LPHO) and some applications now use mixed vapor lamps called “amalgam” lamps. These require more electrical input and generate more UV output. LPHO lamps are roughly twice as powerful as LP, and amalgams may be about four times as powerful as LP. UV Lamp, on left, and a quartz sleeve (for a shorter lamp). UV dosage is typically measured in units called "Joules," and it is most frequently expressed in terms of "mega Joules per square centimeter," or mJ/cm². (Microwatts per second per square centimeter, expressed as µWs/cm2, and mJ/cm2 represent the same dosage and the two systems are used interchangeably.) The higher the number, the higher the dosage. The tendency now in UV dosage is to follow the “more is better” view we've all been indoctrinated in. If ten nuclear bombs will destroy the world, to be safe we need ten thousand. The most common concerns, e Coli, Giardia, and Cryptosporidium, are effectively eliminated at less than seven mJ/cm². The minimum dosage now recommended by NSF, however, is 40 mJ/cm². Also a factor is general absorption of the UV light for unintended purposes. UV makers usually require that water have less than seven grains per gallon hardness, less that 0.3 ppm iron, less than 0.05 ppm manganese, and that it be generally clear and free of particulate and tannins. All of these can create situations where the light is absorbed and, therefore, its anti-microbial activity is diminished. Hardness, for example, can form scale on the outside of the quartz sleeve which blocks the passage of light. The good thing about UV is that in addition to being a very effective treatment for microbes, it is relatively simple and inexpensive to buy and to maintain. It adds no chemicals to the water and leaves no “by-products.” It is very safe, if you follow a couple of simple rules (like don't stare at a burning UV lamp because it can damage your eyes, and remember that treatment chambers can be hot to the touch). Compared to ozone, chlorine, or even hydrogen peroxide, UV is a very safe home treatment. Also, compared with other treatments, UV requires little maintenance. The main disadvantage of UV as germicidal treatment is that it has no residual effect. Bacteria are treated when they pass the lamp, but contamination that occurs downstream of the lamp is not treated. Chlorine, by contrast, stays in the water from the point of treatment to the final point of use and prevents reinfection. The need for a constant supply of electricity can be seen as an additional disadvantage. If the power goes out, you shouldn't use the water. Above, a very basic UV system. The quartz sleeve, lamp inside, inserts into the stainless treatment chamber. The simple control system provides both visual and audible warning of UV lamp failure. The system comes in 2, 6, 8, and 12 gpm versions. The lamps provide strong UV dosage (30 mj/cm2 at the end of the lamp's life) that is certified by independent testing (BioVir). Very easy to install, the unit wall mounts with two simple clips. Classic Plastic Pura Units. We've just completed our 25th year in business, and Pura was one of our first products. We started selling plastic-housing Pura UV systems just a couple of years after Pura went into business in the late 1980s, so it's a product dear to our hearts. The Pura #20 lamp, used on all whole house plastic units, is, in fact, our most successful product in terms of sales. We stock all units and all parts, "every nut and bolt," of plastic housing Pura units. We have an entire website, http://www.purauv.com, devoted to plastic-housing Pura units. We're the best source, anywhere, for plastic Pura units and parts. We have some expertise with the units and can help with service issues. Stainless Steel Units. We have stainless units both by Pura and Watts. We aren't offering complete stocking of the recently-created Pura stainless units yet, but we have them on the Occasional's website and can provide units and parts upon request. 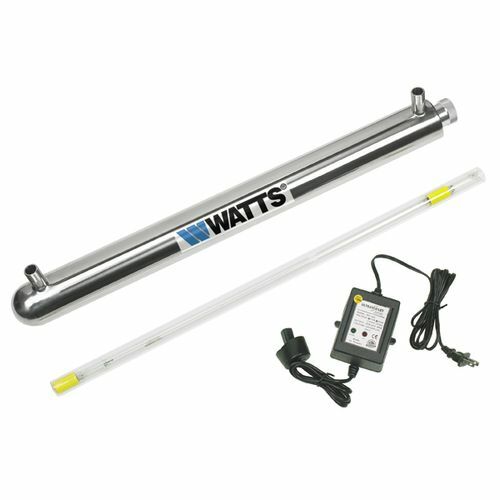 We stock all systems and parts for the Watts stainless units, as pictured above, although they must still be ordered by phone. We don't yet have them on our main website, but you can see them on the Occasional's new products listings.